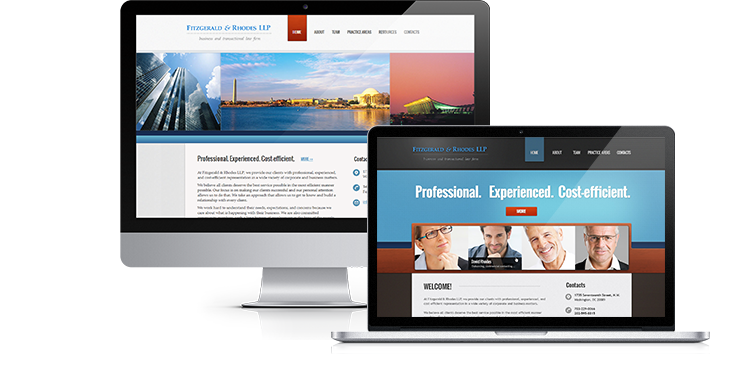 3rd Gen Law Group LLP (formerly Fitzgerald & Rhodes LLP), a law firm that specializes in the practice of business and transactional law, was looking for a clean, modern, and professional looking website with a content management system (CMS). We made it possible for a firm to go online and attract more clients for their business. We proposed a variety of different design versions until we found the best solution. Right&Above professionals worked hard to meet all the client’s requirements by carefully selecting the best images, changing the layout, navigation bar, color scheme, background style and fonts. The website pictures were processed to look great and maintain the same quality on any screen resolution or device including mobile phones and tablet PCs. A specially designed pop-up icon on the start page appears upon a click on the call-to-action ‘MORE’ button and prompts a user to learn more about the company. This feature was developed using JS and jQuery framework. Other pages have the original internal design with a different layout on every page and a large number of small, thoroughly elaborated elements. The website is built on a modern architecture that puts extensibility and flexibility first. The content can be easily replaced or extended. The website is powered by WordPress CMS that allows even inexperienced users to adjust the content of any page intuitively and quickly. This enables our clients to make all necessary changes themselves without turning to professional help, which proved to be a cost-effective solution for them. Using CMS, they can easily edit the content and add new articles, pictures and other information at any moment. Our mission was to empower our clients to create and manage the content and reduce their costs on maintenance to the maximum extent. From design to development, we were carefully thinking of our client, which made the website user-friendly and allowed us to deliver the exact presentation of what the client had in mind.